Discussion in 'Season 47' started by Phillip, Mar 11, 2017. Elmo keeps hiding from Nina because he wants more time to play before his bath, but Ernie helps him realize that he can play in the bathtub, too. This episode features an all-new street story, a new "Rubber Duckie" celebrity montage and Elmo Word ("Bath Time"). If you saw "Elmo Comes Clean" please like this post and share your thoughts below. The big thing about this episode for me was the exclusion of a recurring segment (Smart Cookies, Super Grover 2.0, Murray Has a Little Lamb, etc. ), because they were otherwise able to include a lot more in the half hour. That being said, the street story was very reminiscient of Episode 2637/2916 from Season 21/23, in which Gina was babysitting Elmo and having trouble getting him to take a bath. Nice to see Ernie make an appearance in the street story, along with Big Bird and Oscar (both who now sound exactly the same as far as voices go). I actually liked the Elmo's teeth-brushing hip-hop number - had quite a number of celebrity cameos like Bruno Mars, Nicole Kidman, and Wendy Williams, and others, not to mention this was the episode with the updated "Rubber Ducky" with Tori Kelly and some of the previously mentioned celebrities and more like James Corden, Mushroom Hair, James Derulo, and others. We got both the new Letter/Number songs this time . . . but an old EW recycled . . . doens't make a whole lot of sense. The remake of "Singing in the Shower" with Baby Bear and Elmo (which appears to have been from a previous season, since Baby Bear's showering in front of Elmo's old apartment) wasn't as catchy as the original, but it was nice just to see Baby Bear again. I'd venture to say this was probably one of my top tier episodes of the season so far, if mainly because as I said, excluding one of the recurring segments gave us more other inserts to enjoy during the episode. The cold open with Ernie was fun. The street story was pretty good. 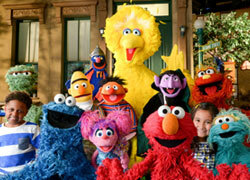 I noticed they used Caroll's Big Bird puppet even though he wasn't puppeteering. I liked that Rubber Duckie's cousin Bill has a mustache. It was interesting to see Brush Your Teeth from the 2012 Healthy Teeth initiative. Also the use of Singing in the Shower from 4229 was unexpected. The new version of Rubber Duckie was better than Daveed Diggs version. Billy sounded just like Jim when he sang it. I noticed they used Caroll's Big Bird puppet even though he wasn't puppeteering. In that case, I wonder if it was Matt puppeteering or someone else, since they normally use two different puppets for Matt and Caroll, I always assumed it's because they have different measurements, so i'm guessing maybe it wasn't Matt, unless they made some adjustments to the costume to fit him better. This is how I thought the new episodes would/should be formatted like; one long-form piece with a bunch of little segments. Nice to see Ernie in action at last. Didn't expect to see those two random, re-used musical numbers, but I guess they didn't have much material of baths. I dug the new "Rubber Duckie" montage. I hope they re-shoot the segment again so there's a definitive, HD version. I found an interview with Noel MacNeal where he said he filled in for Big Bird a few times on season 47 since Matt was in LA working on the Muppets ABC show. So it could have been him. Did Noel do the voice? Prior to Matt, Caroll was considering Noel being his Big Bird understudy, but he apparently just couldn't quite get the voice right. Makes sense, Noel himself has a really distinct voice, and Big Bird's isn't an easy one to achieve. Noel also has tons of experience large, full-body characters (BITBBH, Eureeka's Castle). I'm sure that's why Caroll was considering him to be Big Bird's understudy. 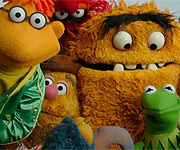 I was surprised to see on Muppet Wiki that Bert also shows up in the new Rubber Duckie. Does he sing a line? I saw a few images from the segment and saw that Ernie and Bert appear in a CGI/illustrated room. It's a shame they didn't use their old set.... But I wonder the Ernie and Bert apartment set still exists (might be a topic for another thread). I agree completely. It was nice that they filled the time with celebrities singing a classic SS song that we all know and love. Plus Billy really had a chance to shine as Ernie in this ep. Kee hee hee hee!